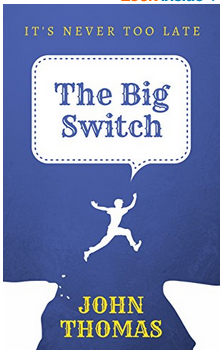 If I had to review "The Big Switch" by John Thomas in 2 words, I would say “totally relatable”. Right from the first chapter, the protagonist Keith is someone who would come across every day if you work for a software company. Or he might even be you. Coming from a humble background, wanting to prove himself, struggling to say NO to a horrible manager who dumps all work on him, leaving him with no time for anything else, colleagues who frown upon and make a big issue if he tries to leave office by 6PM - he faces all the struggles and challenges of working in a high pressure IT job. He figures out in 2 years that this is not what he wants to do for the rest of his life. He meets a mentor who inspires him through positivity, passion and a sense of purpose. As Keith identifies his passion and tries to make the big switch, he faces numerous obstacles along the way. With help and support from friends, he moves ahead in his life and becomes a better person. It was an easy read, as the story moved at a good speed. Relatable characters and incidents make you nod at several places. The evil boss, Mathur is someone whom many of us would have come across at some point in our careers. Though we may or may not have met Ramesh, the mentor, we come across certain people in our lives who inspire us to pursue our dreams. This character exudes so much positivity and confidence, that I wish a few more pages on his journey would have been nice to read. I was so glad that the ending wasn’t an easy sail for Keith. Reality and uncertainty are something that we all have to live with. How we respond to such unexpected events shows our true character. It seems that the author is very much inspired by Paulo Coelho’s The Alchemist. The reference to this book in multiple places and how Keith felt motivated after reading it made me want to re-read “The Alchemist”. “Some memories live forever. Fighting the steady and strong flow of time, they remain etched in our hearts”. There were a couple of hilarious phrases too, especially the one when Keith asks for a day off and his manager’s reaction was that of someone asking for his kidneys :-) It might sound exaggerated but unfortunately, that’s the reality in many software organizations, especially startups. I wouldn’t call this book a must-read, but an inspirational novel that one can pick up in an afternoon and finish it. It is available as part of Kindle Unlimited. There were a couple of editing issues that I spotted in Kindle version - character name mixup and grammatical errors. Hope these get corrected in the revised edition. P.S. "This review is a part of the biggest Book Review Program for Indian Bloggers. Participate now to get free books!"